You are here: Home>People>We are sailing! 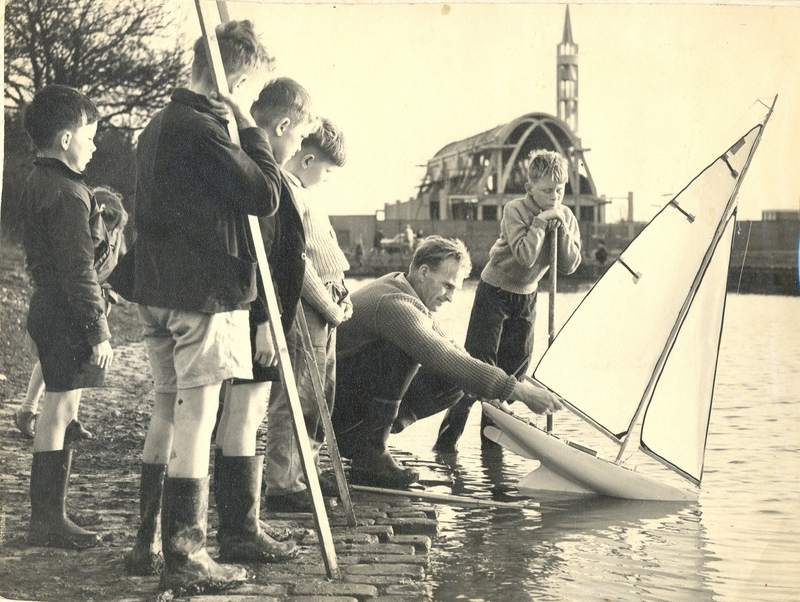 This photo was taken around 1958/9 in the town centre pond. My father used to race model boats in Clapham Common and brought them up to Stevenage. This certainly attracted the attention of the little kids. The church is still being built in the background. What good times I spent sailing my boat there, between 1961 and ’70. I lived during this time at Josette House, in Sish Lane; recently these flats have been flattened. I also recall being involved with rafting on this pond……. Hi Martin, I fished the pond between 1967 to 1970, I remember catching Perch and Roach in there. One of the adult anglers I remember caught a Pike and this was taken out and left behind where the above photo was taken. I went back to Stevenage at the end of August 2013, the pond now has a lot of weed and seems to have only Goldfish swimming in it, it also seemed a lot shallower then I remembered. Message to Alex and Evan, it is wonderful reading about your fishing adventures at the Stevenage pond/lake. When I was young boy growing up in Stevenage my buddies and I would go and catch frogs and newts at the spring /small pond which is now of course the town pond, as I grew older and fishing became the most important thing in life I was part of the team that stocked the town pond with the fish (Rudd) from a pond in Fishers green located behind the riding stables and the pub I can not remember putting any carp or tench into the town pond ? however that was over 50+ years ago. I used to fish in this pond as well. In fact I went down to fish every weekend and spent most of the summer holidays there. I can remember the carp basking in the sunshine. These are some of the best memories of my life, I have always regretted my parents moving from Stevenage to Wales. I have always and will always regard Stevenage as home, I loved the people and the town which is not something I can say about Wales. I used to fish in the pond. There were quite a few of us fishermen and quite a few fish too. I once caught a lovely Tench of about 2lbs. I once dropped off to sleep waiting for a bite and fell in too. A long cold and wet walk home to Basils Road!